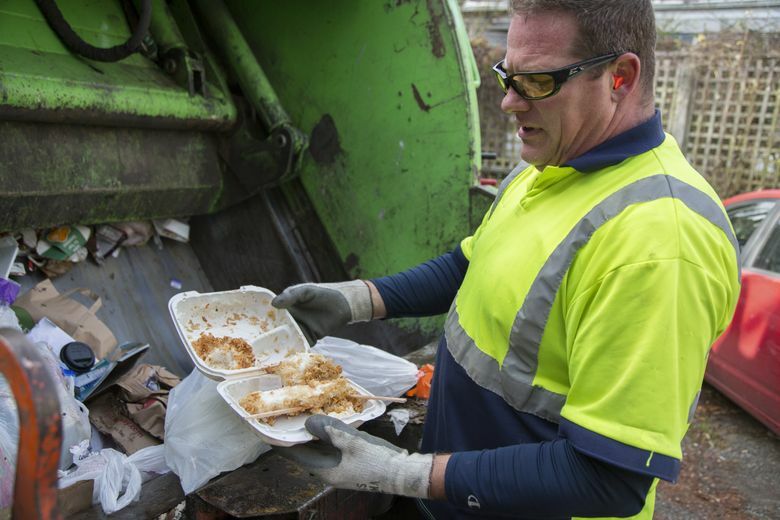 Seattle’s ordinance allowing garbage collectors to look through people’s trash — to make sure food scraps aren’t going into the garbage — was declared “unconstitutional and void” Wednesday. It is in Seattle that the constitutionality of the city checking what was in that teriyaki carton in your garbage became a court case. On Wednesday, King County Superior Court Judge Beth Andrus ruled that what was in that carton stays private. She entered an injunction against its enforcement. “I’m thrilled as can be,” said Ethan Blevins, attorney for the Pacific Legal Foundation, which filed the lawsuit on behalf of eight Seattle residents. The ruling concerned just how much garbage collectors could look without invading the privacy of customers. City residents have long been asked to place food scraps in the same bins as their yard waste. That way they would be composted instead of ending up in a landfill. But starting in January 2015, they were told that not complying would carry a $1 fine for single-family homes and $50 for businesses and multifamily dwellings. Mayor Ed Murray said he was postponing the fines because cooperation was so widespread. It wasn’t the fines that the lawsuit was about. She remembers a TV crew coming to the Phinney Ridge home in which she lives with her husband, Steve Davies, an IT administrator, after the lawsuit was filed in July 2015.